Tantalus was a character of ancient Greek mythology, forced to stand in a pool of water beneath a blossoming fruit tree. The fruit, however, was permanently out of grasp and the water he stood in continuously receded before he could drink it, trapping him in an endless state of agony. 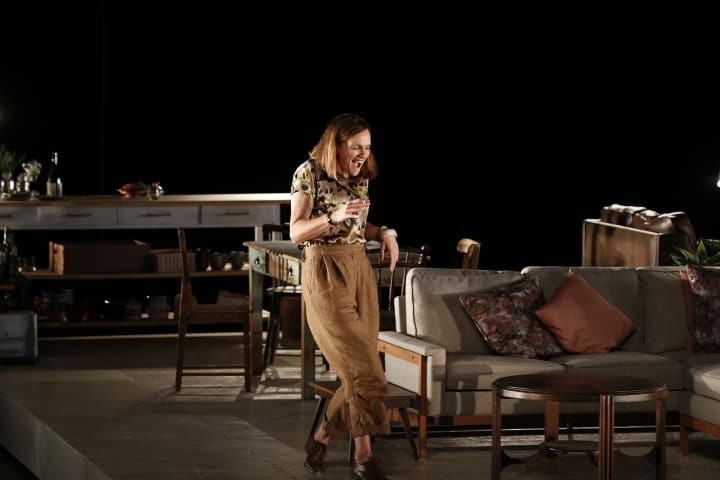 In the final scene of Joanna Murray-Smith’s acerbic comedy Three Little Words, a treasured family heirloom smashes spectacularly on stage – the Tantalus. For those not in the know, a Tantalus is a small wooden structure, like a mini cabinet, that holds two or three decanters secured by a wooden door that locks. This lock and key feature was historically intended to keep servants and children away from the whisky. The Tantalus takes its name from the Greek mythological character Tantalus, son of Zeus, who notoriously spent most of his existence in Tartarus – a dark abyss used to imprison Titans and inflict endless torment. Amongst other crimes, Tantalus was supposedly sent to Tartarus for stealing ambrosia and nectar from the gods. 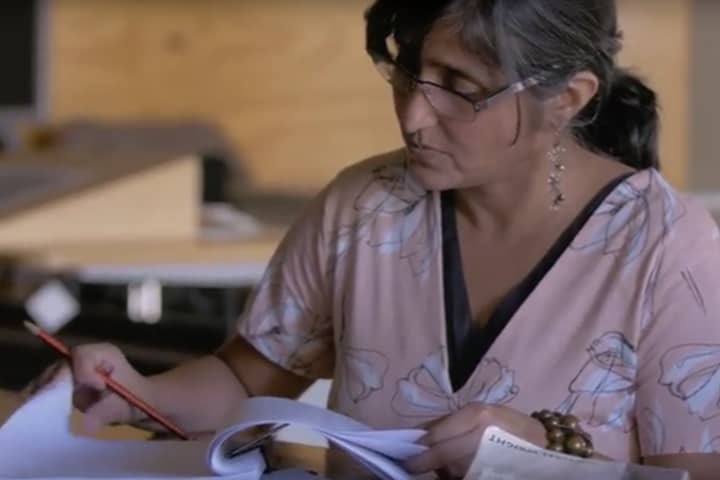 Joanna’s inspiration for writing this obscure object into her play came from an experience sorting through her parents’ possessions, alongside her siblings, in the wake of her mother’s death. ‘The Tantalus was sitting there, and no one was fighting over it, but it planted a seed for this storyline,’ she said. Writing about a Tantalus smashing on stage is quite different to designing, manufacturing and executing the smash for 45 performances. It takes a team of people to pull a theatrical stunt of this nature off night after night, and several key staff members at MTC have been key to this process. Three Little Words Costume & Set Designer Michael Hankin worked with MTC Props Supervisor Geoff McGregor to build the cabinet structure, which used one of Geoff’s personal antique handles. Then Props Buyer Jess Maguire engaged business owner of Killer Art, Andrew Bowden, to develop a silicon mould and sample of a sugar glass decanter. 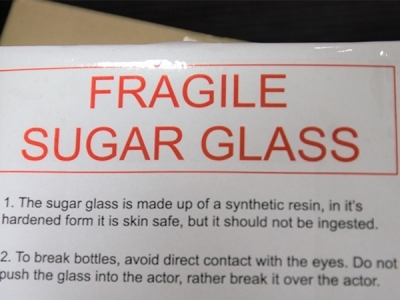 Sugar glass, or breakaway glass, is made from a mixture of specialty resins. One part of the resin mix is especially brittle, whilst the other has a harder plastic quality. The mixture of both resins allows the finished product to maintain a solid structure. However, once it starts to break, it crumbles to pieces very quickly. This allows the decanter to smash on stage without harming any of the actors or audience members who come into contact with the broken pieces. 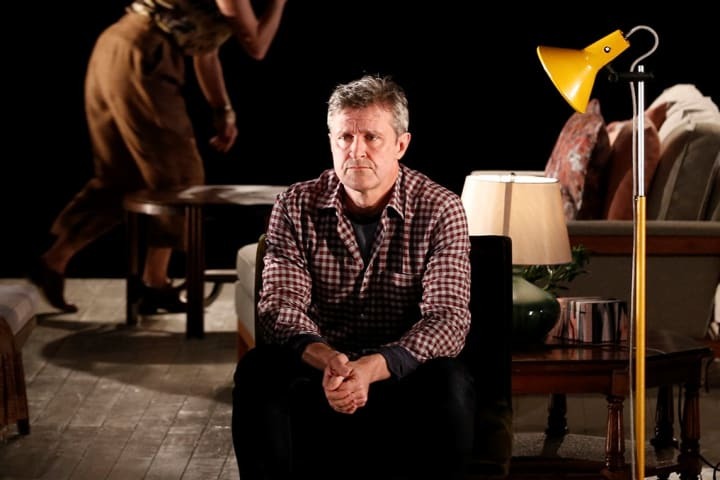 Breaking the Tantalus for 45 performances required several delicate deliveries from Killer Art to MTC. 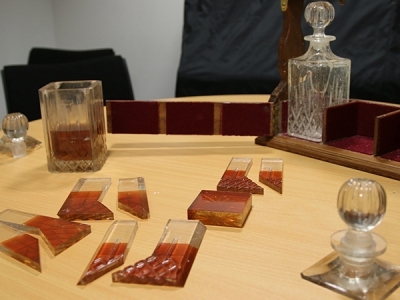 Assistant Stage Manager Benjamin Cooper spent a minimum of 15 minutes before each show assembling the acrylic decanter alongside the breakaway decanter, which required extreme delicacy in its handling. One of the acrylic decanters is made of painted plastic pieces, which are connected and reinforced by double-sided tape and secured with crystal-gloss tape. 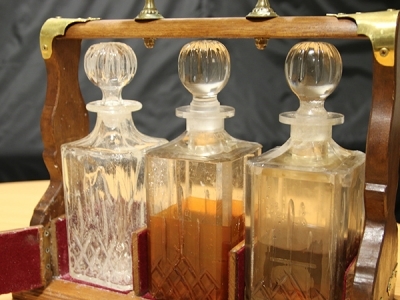 The cast uses the third decanter to drink out of throughout the show, which is also acrylic, but stays intact, and is filled will water and browning essence, rather than Scotch. Both the breakaway decanter and sticky taped decanter are expected to smash in every performance. However, the wooden Tantalus structure varies with each impact and has been repaired by Geoff upwards of twelve times throughout this season, usually with Ben running the broken prop from Southbank Theatre to MTC HQ late at night, ready for repair in the props department early the following morning. 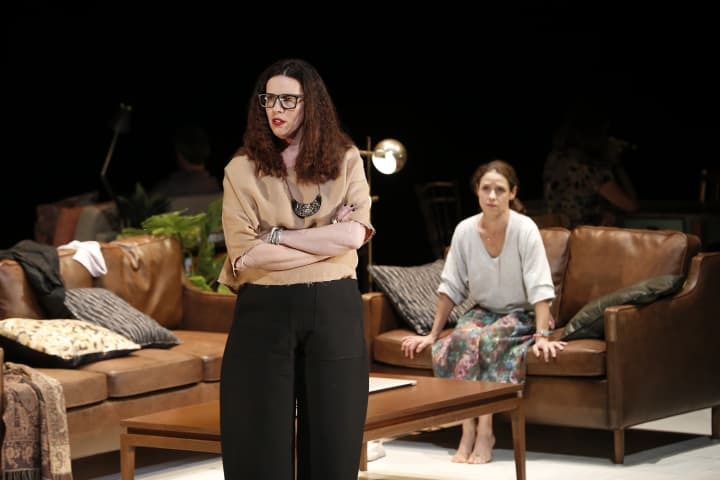 In Joanna’s play, the Tantalus represents the only thing Tess and Curtis want in their separation. Annie reminds them that goodness and kindness matter more than any material possession. At MTC the Tantalus represents teamwork. It epitomises how this company operates with creativity, resourcefulness, cohesiveness and goodness. Business owner of Killer Art, Andrew Bowden, shares his insights on how breakaway glass, more commonly known as sugar glass, is manufactured. How is breakaway glass actually made? Breakaway Glass bottles are produced using silicon moulds. An exterior mould is taken of the bottle, or glass. Then the resin is poured into the mould at around 140 degrees. The mould is turned so the insides are coated in the resin, then the excess is drained from the mould. Is Sugar Glass used for any purpose other than performance? The glass is typically used when there is a requirement to break a glass object and safety considerations must be taken into account. Some wedding and function venues will not allow real glass to be broken on their floors. Also, some corporations will use a breakaway champagne bottle to christen a boat, rather than the real deal. Typically, the use of breakaway glass is restricted to theatre and film projects. Is it expensive or difficult to manufacture? The main cost with breakaways is the materials cost of high quality moulding silicon and the resin product itself. Bottles and glasses generally don’t use up a lot of product, however when making panes of glass, a lot more product is used and the costs rise significantly. The techniques of making breakaway glass are not readily available to the public, so learning how to make the glass is very much a trial and error basis. Along with that, some items can be trickier than others to produce and sometimes there needs to be a bit of creativity and a lot of patience to end up with a quality finished product. It takes a lot of patience. If you rush it, you will break it. If you don’t concentrate, you can give yourself a nasty burn. When it is all working for you, it can be very satisfying. However, it can also be mighty frustrating. 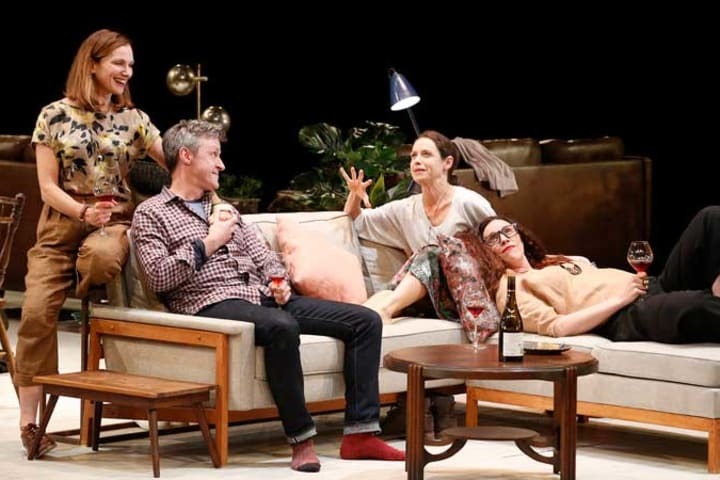 Three Little Words played at Southbank Theatre from 18 April to 27 May.